In Jan 2012 I weighed 245 pounds. About 60 pounds over a “good” weight for my height. I was scheduled to go on a 2 week backpacking trip with my sons in July 2012 in New Mexico at Philmont Scout Ranch. 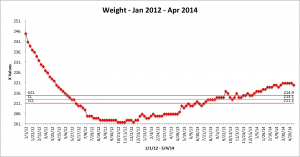 The maximum weight allowed for my height to be allowed on the trails was approximately 214 pounds. The camp did not want people on the trails, 50 miles from medical attention, that were pre-disposed to have issues due to their weight. I was not physically capable of a 2 week, 75 mile hiking trip with a 45 pound backpack. With the excellent Weight Watchers online for Men program, and lots of time on the elliptical, in six months I made it to weigh in at my physical in June. 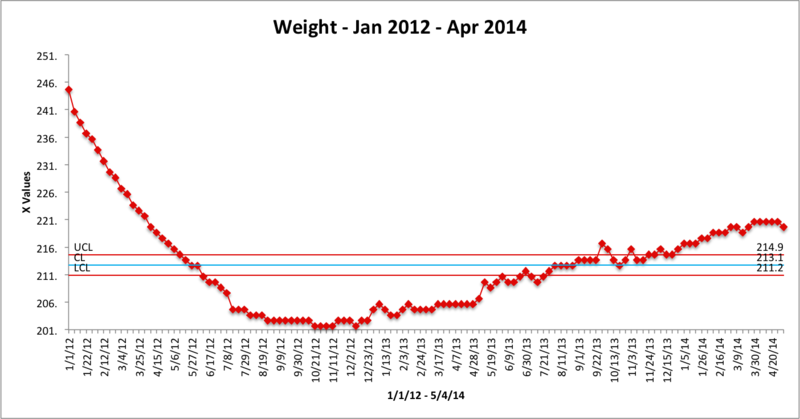 However, just like many continuous improvement projects, I didn’t follow my control plan closely 6-9 months later. I’ll be using this info for a series of posts about practical application of control plans and some data analysis tools like the control chart in this post.